A desperate battle was fought overnight in a hellish environment as if it were a scene out of the apocalypse. 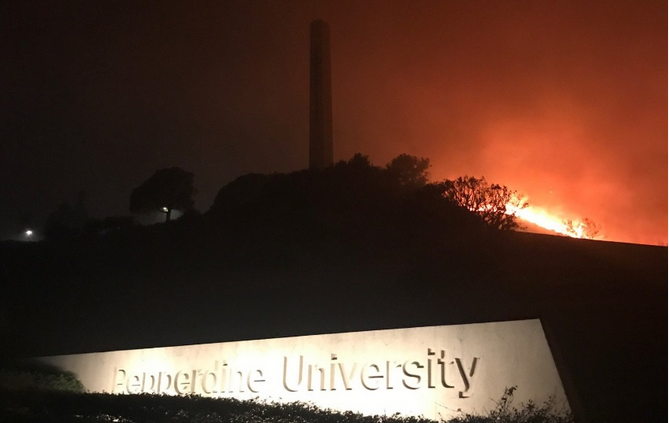 Firefighters gave it their best efforts to save of the most cherished local colleges, Pepperdine University in Malibu. But it wasn't just a fight for a building; it was a fight for the hundreds of students and staff who were trapped inside sheltering in place. Rob Marciano of ABC news captured this hellish video from the campus of Pepperdine. The firefighters launched a full-scale offensive striking at the blaze by air and on the ground. As the sun came up, a miracle appeared to have saved the firemen and all those at Pepperdine because the fire was prevented from doing any major damage thanks to the brave firefighters who risked their lives all night. Some of the universities outbuildings suffered some damage including the library during the tense fight with mother nature. This ominous photo shows how close the fire was coming to the University's grounds. Sadly, the people at Zuma Beach near the Pacific Ocean were not as lucky, and hundreds of buildings were destroyed. There have even been 11 confirmed deaths where some people fleeing the fire could not get away fast enough and were burned in their cars. President Trump seemed to believe the state was squandering the billions in federal aid given to the state each year to help prevent disasters like this. He called for better forest management that could have prevented the massive spreading of fires. One method is to clear all of the old and dead underbrush by doing a flash burn which destroys all of the fuel a greater wildfire would need to continue spreading. Last pic of people 'desperately evacuating' and there's a woman standing in the street. Talk about fake urgency. Not all, just the communists, socialists, Marxists and Democrats. No need to lump the Conservatives in with the trash.